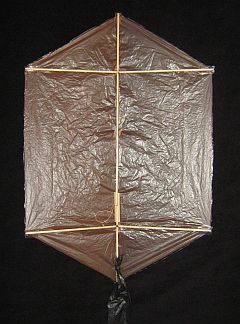 These Rokkaku kite plans and hints are aimed at summarizing the more in-depth instructions to be found in the How To Make A Kite section of this website. 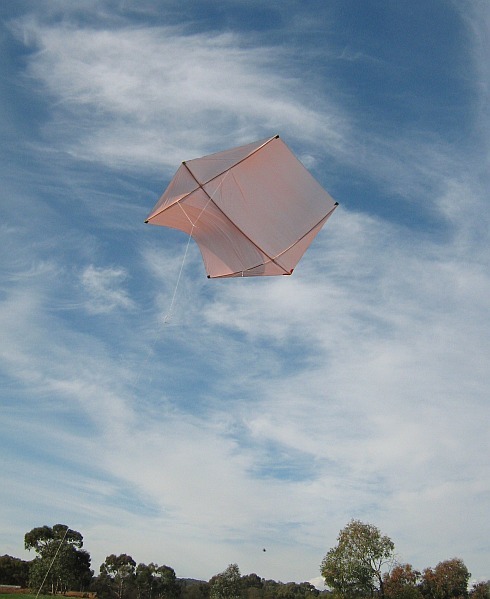 Try my Making The MBK Dowel Rokkaku Kite PDF, if you prefer to work offline or from printouts. The one on the left is of the front surface. 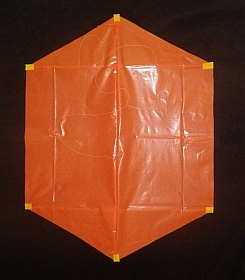 That is, the side of the kite which faces the flier. The other photo is of the back surface, which exposes the spars. For all 3 designs, attach flying line to the bridle with a shiftable knot, for later trimming. Also, all 3 designs work well with light single-ply plastic for sail material. Many large plastic bags are suitable. 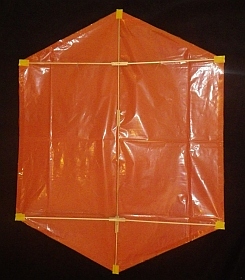 Light Tyvek or rip-stop Nylon can also be used. Reinforce the sail edges by adding clear sticking tape over the outlines, then trimming back to the outlines as you cut out the sail. Secure the sail to the spar ends using short lengths of electrical insulation tape, wrapped over the tips. Lash the spars together where they cross, with whatever light cord you can find - use a drop of glue to secure if necessary. 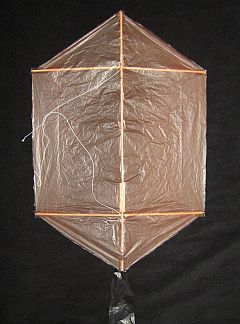 Make the upper and lower bridle loops about 3/4 as long as the kite is wide. At the bridle attachment points, a Single-wrap Slip Knot should be sufficient, secured with a spot of glue. Connect the 2 bridle loops with another line of similar length, using shiftable knots such as the Prusik - the kite can be trimmed left or right with the upper knot, if necessary. 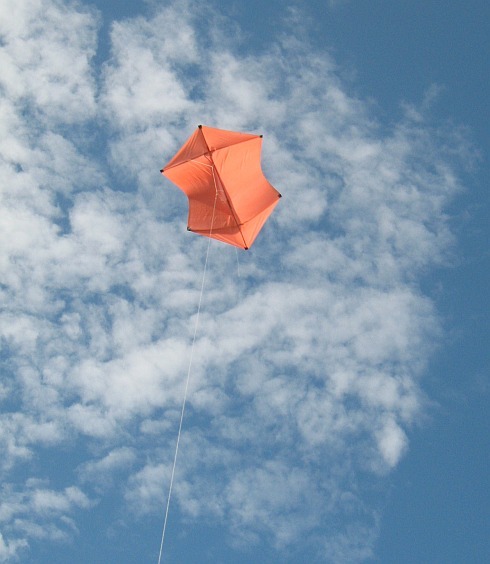 No tail is required for this kite. 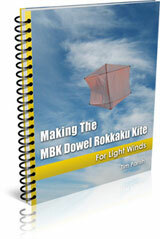 Don't forget my Making The MBK Dowel Rokkaku Kite PDF, if you prefer to work offline or from printouts. Reinforce all the skewer joins with 2 lengths of skewer, 0.15SL (4.4cm, 1 3/4") long, glued to both sides of the join as in the plan. While gluing the upper and lower spars with the tips raised off the table, the short reinforcers stay flat on the table. The upper horizontal spar tips should both be 0.10SL (2.9cm, 1 1/8") off the table while the lower spar tips should be 0.15SL (4.4cm, 1 3/4") off the table. 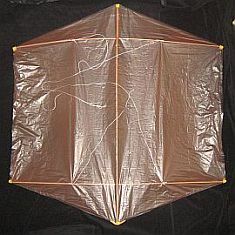 Try an upper bridle loop about as long as the kite is wide, attached where the sail holes are indicated near the top of the plan. Another line, about 3.0SL (87cm, 34 1/2") long, goes from the middle of this loop down to the remaining sail hole. Reinforce the vertical skewer join with 2 lengths of skewer, glued to both sides of the join as in the plan. Secure the sail to the spar ends using short lengths of clear sticking tape. A 2-leg bridle works well, 2 skewer-lengths long and attached where indicated on the plan. 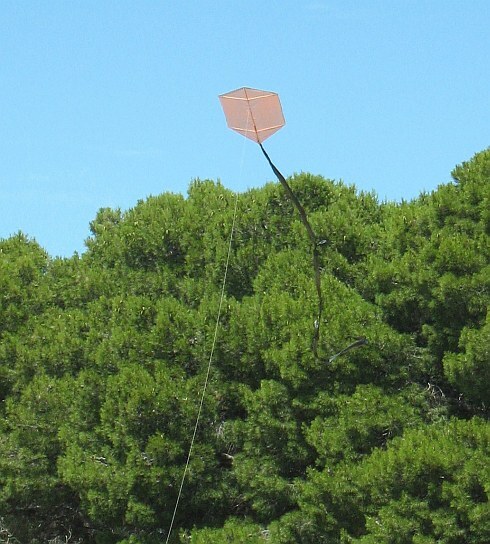 For a start, try using a simple streamer tail about 8 times as long as the kite is high. Add more to let the kite fly in stronger winds. Very un-traditional little Rok - but fun! 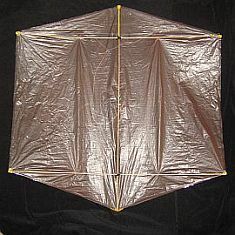 I hope one of these Rokkaku kite plans is just right for you!